The 2018 election will be pivotal for discerning the kind of imprint Gov. Susana Martinez— the first female governor of New Mexico and the first elected Latina governor in the United States — leaves on New Mexico policies and laws. There’s a good chance many of her priorities, if not her methods, will live on if her successor is Republican Steve Pearce. Not so much if Democrat Michelle Lujan Grisham moves into the Governor’s Mansion. How much she shapes New Mexico’s appellate court for the long term is another area worth watching. Six judges on the 10-member court are Martinez appointees. Four — all Republican — face Democratic challengers this November. 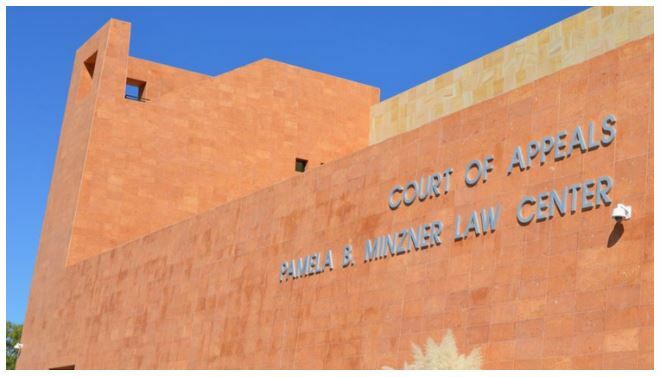 The appellate court is an important judicial panel. Each year it hears about 900 cases on appeal from New Mexico’s trial courts. New Mexico’s election process for judges is an odd duck. Governors appoint them to vacant seats on the state’s various courts. In order to serve a full term, appointed judges must compete in a partisan campaign in the next election cycle. New Mexico is one of just seven states that require judges win a partisan election. If they win, judges are only required to stand for “retention” in elections thereafter — meaning they appear on the ballot unopposed and must garner 57 percent of the vote to keep their seats. The four Republican Martinez appointees who have drawn Democratic challengers for an eight-year term on the appeals court are running in partisan elections this year. Her lone Democratic appointee is running unopposed. Judge Miles Hanisee is up for retention. All publicly financed, the Republican candidates each received $208,445 from the state’s public elections fund while their Democratic challengers have each received $222,504. The amounts are calculated based on the number of voters registered with each party. On the Democratic side, the four candidates are using three different consultants associated with the Democratic Party — Traci Cadigan, Brian Morris and Heather Brewer — and contracting with several media firms. However, all four Republican campaigns are using Martinez’s longtime adviser and consultant Jay McCleskey. McCleskey Media Strategies is providing video and other media strategies for a total of almost $70,000, according to campaign finance reports filed last week. An additional $7,000 from each candidate for statewide surveys and media guidance was paid to Public Opinion Strategies, the firm where his wife, Nicole McCleskey, is a partner. McCleskey is known for hard-hitting media campaigns, both for candidates and political action committees he’s been affiliated with over the years. These are the only four New Mexico candidates paying the McCleskey-affiliated companies as of last week’s campaign reports. 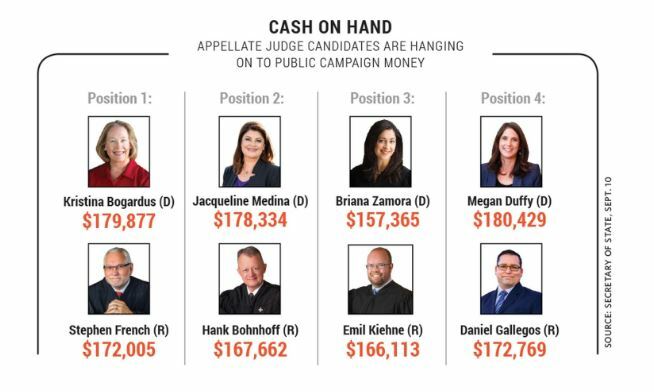 All of the appellate court candidates — Republican and Democrat alike — still have the bulk of their campaign funds to spend, leaving plenty for advertising as Election Day draws near. General wisdom is that judicial candidates don’t go for negative campaigning. But there’s plenty of independent PAC money in the mix this year, a good chunk of it connected to McCleskey. McCleskey Media Strategies has billed $810,791 so far this election cycle to four PACs: New Mexicans for Progress, Advance New Mexico Now, Susana PAC, and NM Prosperity. Cash on hand as of September 10, 2018. Graphic by Santa Fe Reporter. The notion struck Megan Duffy at an event she attended with several other women — and it struck her hard. It was Aug.